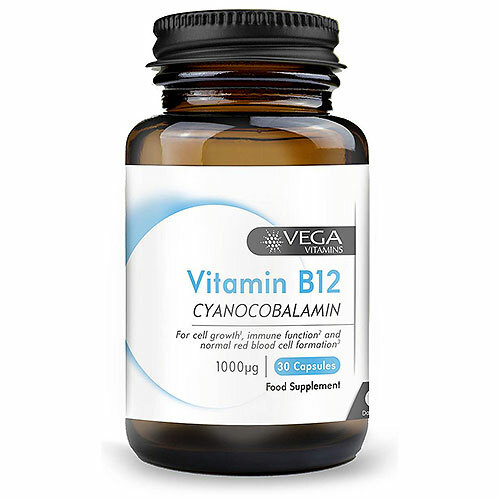 Vitamin B12 plays an important role in the synthesis of DNA and is therefore necessary for the healthy growth of every cell in the body, particularly the bone marrow and red blood cells. It also plays an important role in fatty acid metabolism and in helping to maintain a healthy heart, immune and nervous system. Heavy drinkers, smokers, individuals with a poor appetite or diet, menstruating and pregnant women, adolescents, the elderly, and those with a mentally or physically demanding lifestyle may have an increased dietary requirement for Vitamin B12. Vegetarians and vegans may have an increased need for vitamin B12 as bio-available sources from vegetables do not store this vitamin; unlike meat, eggs and dairy products. Vega Base (Acacia Gum, Fruit Juice Concentrates (Aronia, Apple & Elderberry, Blueberry & Blackcurrants)), Vegetable Capsule Shell (Hydroxypropyl Methylcellulose, Colours (Titanium Dioxide, Copper Chlorophyllin)), Anti-Caking Agent (Silicon Dioxide, Magnesium Stearate), Vitamin B12 (Cyanocobalamin). As a food supplement for adults take 1-2 capsules daily with food or as directed by a healthcare professional. Do not exceed recommended intake. 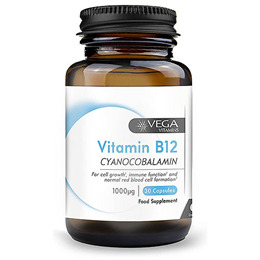 Below are reviews of Vega Vitamins Vitamin B12 - 30 x 1000mcg Capsules by bodykind customers. If you have tried this product we'd love to hear what you think so please leave a review. Vitamin B12 plays an important role in the synthesis of DNA and is therefore necessary for the healthy growth of every cell in the body, particularly the bone marrow and red blood cells.